The Vanguard Group is an investment company with over $2.0 trillion in assets, offering mutual funds and other financial products and services. The investors who place money in the funds own Vanguard. Based on his undergraduate thesis at Princeton, founder and former chairman John (Jack) Bogle is credited with the creation of the first index fund and driving costs down in the mutual fund industry. Mr. Bogle founded Vanguard in 1975 and served as chairman and CEO of Vanguard until 1996, and senior chairman until 2000. He is now President of the Bogle Financial Markets Research Center. Mr. Bogle is a best-selling author of ten books, including Battle for the Soul of Capitalism; Enough: True Measures of Money, Business, and Life; and most recently The Clash of the Cultures: Investment vs. Speculation. Bogle: Let me just say before you get the interview started that I tend to be blunt, and the questions you sent me skipped some of the essential keys to leadership: specifically, vision, passion, and clarity. We have an awful lot of people in corporate America who don’t have any of those qualities–and seem to do fine by the way–but for me they are important, particularly if you are going to build something that’s different. How would you describe Vanguard’s leadership approach in the years that you were there? Bogle: It is totally different today. We started as a tiny company in 1975. We had 28 crew members, and seven or eight years later, we were up to 1000. We had a very free-form organization that responded directly and immediately to what I wanted to get done. It was a high-ego, high-confidence, and a high-enthusiasm approach, in which the integrity of the leader was absolutely essential. One definition of a leader is somebody who has followers, and people aren’t going to believe in you unless they totally trust you as a leader. So, my approach was very individualistic. I was much more interested in judgment than I was process. When you get to the point when you have 13,000 crewmembers, as we have today, and $2 trillion under management, you have to have, for lack of a better word, a bureaucracy and rulebook with many rules. I don’t know how long our manual is now, but it’s probably 150 pages. So, I approach leadership, I’m sorry to say, as more of a dictatorship than a democracy. I think people understood that. We did not have a lot of high-level executives in the company. We had a bunch of people who were doing the work that was necessary with the commitment that was necessary every day. We had to price the funds every day to stay in legal compliance. We had to handle cash inflows and outflows, and we had to look over our managers and make sure they were doing the best they could. Over a very difficult period, we gradually morphed from an organization in which all we did was administer the funds: legal, accounting, shareholder record-keeping, and so on. We were not permitted to do investment management and distribution of fund shares. But within a few years, we were able to offer investment management (beginning with the first index mutual fund), and then we eliminated our sales organization. No more sales loads. We would rely on buyer “pull” rather than seller “push.” This was a risky step. We succeeded in alienating every broker-dealer in America. But we still preserved the original culture, which is to do well for the people who trust us with their money. We are shareholder-focused largely because of our mutual structure. I’m often asked, “What does Vanguard have going for it,” and I would say from the very beginning essentially three things. One, it has the correct structure, that is to say we are the only mutual fund group that is truly mutual in that our shareholders own our management company. Therefore, there aren’t these diversions to try and make large profits for management company stockholders. The owners of mutual fund management companies in this day and age are mostly financial conglomerates. They’re in the mutual fund business to make money for themselves, not necessarily to make money for their shareholders. I’m sure they’re trying hard to make money for their shareholders, but net of their costs and turnover, they can’t really do it over the long term. And the data are pretty clear on this. Number two, we have the correct cost levels. If you have the lowest costs, you will have the highest net return. When you get into the index fund and money market areas, for example, there is no way you can get ahead if you have higher costs. Having the right structure, having the right kinds of funds, and having the right costs are the keys to success. If you’ve got the right structure, the right funds, and the right costs, then the only other thing necessary is to have the right ethics. The ethic of putting the shareholder first, which is the culture that has survived all these years at Vanguard, demands we be ethically correct. So, my argument would be that if you’re structurally correct, and fund-correct, and cost-wise correct, and ethically correct, I wouldn’t want to be competing with you. When you’re building something in the beginning, the kind of leadership that’s required is very different. I would also say in candor I don’t think I’m much of a businessman. I don’t actually care much for most business values. I think if anybody wants to give me any credit for Vanguard, it is mainly the founding values, the index funds, and the determination to get it right, and to get it right in the way that serves the shareholders. The Vanguard culture is unique. We created a better way. I named the firm Vanguard, which, among other things, means “a leader in a new trend.” But after 38 years, we have yet to find our first follower. Another example of leadership has to do with the language we chose. You can read about this in some of my books, but the language we built up was a fussy, precise language. I couldn’t stand the idea of the word employee. I think it’s a demeaning word, suggesting somebody that comes in at 9, works until 5, picks up a paycheck, and goes home happy. I don’t think people want that. They want to be part of something bigger than they are, and commit themselves to it. I think it’s a huge value-added, a productivity value-added, but, even more than productivity, it’s a buy-in to the culture. If you were to poll us here, you’d find there is quite a bit of that. So, out went the word employee, which I substituted with crew member, which, I admit, does sound a little corny. Then there is the word “product.” I can’t stand the idea of mutual funds as products we peddle to whomever we can persuade to buy them. So, I call them trust accounts, or mutual funds, or at worst financial services. A product is Budweiser beer, Chanel No. 5, or Wonder Bread. I don’t believe that our business is selling products. I think it is providing a fiduciary-focused financial service. Would you consider Vanguard to be a high-performance organization? Bogle: Yes. But a lot depends on how you measure high performance. We measure performance by cost efficiency, and we have the right costs there, that’s just undeniable. Vanguard is not a perfect structure, but I believe it’s the best structure that has ever been invented for the mutual fund industry. I believe the Vanguard experiment has been proven successful. Are there any particular managerial or technical skills that you found were critical in building Vanguard? Bogle: I’m not much of a manager, and I have no particular technical ability, but I think I had the vision. I know I had the vision. You can argue about whether it was the right vision or not. I believe the record is clear on that. I certainly had the passion, and I certainly had the clarity. Clarity today has a lot to do with communication. Leadership should have the ability to stand up in front of the group and persuade it that we’re going in the right direction no matter what the circumstances. Persuade with passion, logic, and commitment. You know what you want: you want people who work hard and are committed, so you damn well better work hard and be committed yourself. I did a lot of speaking in those early days. I wrote a book, even though my heart was failing, and have since written many more, but I don’t think I have particularly good interpersonal skills. I tend to be blunt. I would not hesitate to tell people things that I knew they didn’t agree with, and I don’t mind arguing about anything from a logical, mathematical kind of standpoint. I like to debate in fact-founded debates. If you want to make a list of shortcomings I have as a businessman and a leader, it would be a pretty darn good-sized list. I think I have a healthy personal core, a little bit egocentric. I have a good mind, not great, but good. My emotions are balanced. I very rarely lose my temper. I do my best to honor the tried and true kinds of character traits like virtue, candor, and reflection. I think I have a lot of self-awareness. I talk about my shortcomings. People say, “If you know you have shortcomings, why don’t you do something about them?” Frankly, I’ve never figured out quite what to do about them. So, I continue to have them. We do get a little more wisdom as we grow. Maybe the edge has softened a little bit, although I don’t see that happening much in my case. I’m sure quite a few shareholders still think I’m a leader because I’m, in a way, a moral leader. Maybe an ethical leader would be a better phrase. I’m still an intellectual leader, whether I’m part of Vanguard’s present management or not (which I’m not). I speak from the heart. My new transplanted heart has now been in my body for more than sixteen years, so that may have something to do with trying to make the most of these extra years that I’ve been granted by the Lord. I’m not a natural leader. I know natural leaders, and I’m not one of them, that’s all. I don’t think I’m selling myself short. I think just about all chief executives are overrated, and I think it’s quite possible that I’m the most overrated of all. But I don’t think I’m overrated as an entrepreneur-founder, even though entrepreneurs are trying to make fortunes for themselves. That was not on my agenda. I wanted to do well, but I always thought doing well had something to do with doing your best all day, every day, and the future would take care of itself. When it comes down to it, I’m a pretty simple person. One of the most accurate comments that was ever made about me was intended as an insult but in reality a wonderful compliment: “All this poor guy has going for him is an uncanny ability to recognize the obvious.” I think there is an incredible amount of truth in that. I loved the paradox because the “obvious” is something anybody can recognize. But people don’t, and part of it is they don’t want to recognize the obvious. They can’t face it (although sometimes they do), or they get it wrong, or don’t like it, or they don’t like what I do. But I won’t give up my values. I knew what I wanted to do, and I was extremely dominant in that process. I didn’t borrow others’ ideas, for example, or if I did, I gave them credit. Do you think leadership has a hard edge and a soft edge? Bogle: Well, first of all, I’m a hard edge. I have a theory about decision-making. My theory is that most decisions are easy. Before you make them, all you have to do is ask yourself, “Are we in business for the long-term or for the short-term?” Most decisions have to do with temporary things. I never avoided making tough decisions and making them fast. The soft edge is basically trusting. The shareholders trust us because we’re trustworthy and deserve that trust, diligently serving the crew members and the shareholders. I’m not that role model with all the desired behaviors. My approach to the hard and the soft edges of leadership is best said in one word: “consistency.” Most other executives that I see are much stronger on the hard edge of leadership. The business of being a decent human being doesn’t require a lot, only being a bit thoughtful of other people. I’m not great at that, but I’m okay at it. I’m not some perfect individual by a long, long, long shot, but the reality is that the roots of Vanguard, the inception of Vanguard, the foundation remains intact, but many things have changed. I’m a believer in single-person leadership. I would never say that’s the best leadership model. It’s just the best leadership model for someone with my peculiar characteristics. Other people have different styles. Most people are better listeners than I am. Many have much more technical knowledge. Technology, for example, is a business that I would fail in, utterly fail. But trying to bring investment sense, investment wisdom, and common sense to investing, it’s so easy to do. But you have to walk the walk, as well as talk the talk. And the reality, the simple reality, is that if I hadn’t created Vanguard, if I was still in a conventional mutual fund company, I could not in good conscience do the kind of talking about this industry that I’ve been doing for the last 25 or 30 years. I’ve never liked the idea of marketing in this business. We should focus on management, by which I mean discipline, asset allocation, and portfolio construction, not necessarily active management. A good definition of marketing is finding out what others want and giving it to them. That doesn’t have anything to do with what you should do if you’re in the position of stewardship of other people’s money. Just because everybody wants a gold fund doesn’t mean you should offer one. When we get to administration, the key is making sure you have very careful controls. The real leadership is shaping the company’s path. I don’t see how a group does that. You need leadership to set the examples, but what will determine your success are the overall values of the company. So, I probably denigrate, though I don’t really intend to, other kinds of leadership. We need leadership at Vanguard at every single level of the company, from a manager of a group of six people to a team leader for three groups. We need leadership everywhere, and I think today’s focus on top leadership is unfortunate. I have a strong belief that companies at the beginning, coming out of nowhere, have to have this dictatorial kind of leader, which gradually emerges into a much more democratic format over time, because the values are shaped. They don’t have to be reshaped. Maybe you need a dictator to keep those values in shape in certain situations. How would you then define great leadership? Bogle: Any kind of leadership that isn’t mine. I don’t know. Great leadership is integrity, trustworthiness. I come back to vision, passion, and clarity again, and communications. Leadership is being true to yourself and having others trust you. But not just trust you in the abstract. You have to be right a lot of the time. Your communication has to be understandable. Everybody here understands gross returns minus cost equals net return. It’s the Vanguard mantra. And it’s staying the course. It’s going through times of adversity. As Kipling said, “you can meet with triumph and disaster and treat those two impostors just the same.” You fight your way through both. I say press on regardless, whether you are riding a great wave forward and the winds are behind you, or you’re sailing into a great wave and the winds are right in your face. Sailing is actually a pretty good metaphor, and that’s why I like Vanguard. It’s being the captain of a ship, and nobody is going to want a ship with two captains. I wouldn’t want to be on one. But, it’s also a captain who understands that every member of the crew is a very, very important person. 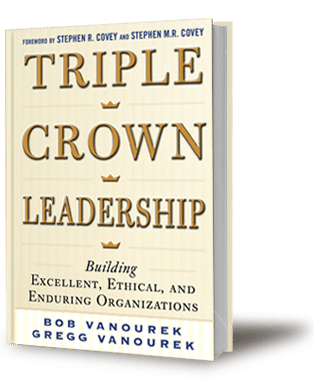 Bob and Gregg Vanourek are authors of Triple Crown Leadership: Building Excellent, Ethical, and Enduring Organizations (a 2012 USA Best Business Book Awards finalist), based on interviews with leaders in 61 organizations in 11 countries.